NEW DELHI: On Board Diagnostics-II is the new buzzword. A trend that will revolutionize the way we and the automakers manage vehicles. Today OBD systems are installed in most cars and light trucks. What began in the ‘70s and early 1980’s as a tool to meet EPA emission standards has come a long way now to where manufacturers use electronic means to control engine functions and diagnose engine problems. Through the years these systems have become more sophisticated. OBD-II, a new standard, though introduced in the mid-’90s, has come to developing countries only in the last few years. The tools provide almost complete engine control while also monitors parts of the chassis, body and accessory devices, as well as the diagnostic control network of the car. “The influx of many international vehicle manufacturers in developing countries like India is driving the market for OBD systems,” says Ashish Gulati, Country Head, Telit India. The market is also likely to witness an emergence of cloud platforms and big data analytics in OBD systems during next four years. According to Market and Market Research, the global automotive market was valued at nearly 90 million units in 2014 and estimated to grow at a CAGR of more than 6 per cent over the next four years. “The market, and legislation for a cleaner environment, will push any OBD system with remote diagnostics,” says Ranajoy Mukherjee, an independent Auto Analyst. Experts predict a rising shift from hardware to software based interfaces for automotive OBD manufacturers. These days OBD enterprises are offering in-vehicle diagnosis and maintenance services coupled with insurance companies offering products. “OBD can also be used as an advanced tool to monitor habits like driving habits, pay as you drive (PAYD), and pay how you drive (PHYD),” says Gulati. Insurance companies are using this to determine premiums of different type of customers based on risk pricing schemes. “It is not widespread yet, but it is definitely in the works. Doing this is beneficial to both sides — the driver and the consumer,” says C R Mohan, VP, Bajaj Allianz General Insurance. In addition to individual drivers, fleet managers need to run operations with optimum efficiency, especially in mission-critical challenges like high operation costs, recurring repairs and frequent vehicle downtime. OBD II vehicle diagnostics allows managers to remotely monitor vehicle performance, engine malfunctions and driver behavior to improve vehicle reliability, security and reduce costs. A classic example is the running of Formula 1 cars where in OBD II is at its full display. F1 mainstay McLaren has brought in diagnostic tools it built in its F1 race cars to new models. Like the McLaren F1. “Developed for the track and honed for F1, the on-board diagnostic computer continuously monitors and logs a myriad of metrics to identify and diagnose faults,” says McLaren. The same thing is done, on a much more extensive scale, in F1 race cars. In the US, solutions based on OBD (On-Board Diagnostics) like dongles have become preferred options. The driver simply connects the dongle to the OBD connector — the interface that vehicle repair shops use for reading vehicle information. These dongles are relatively cheap with no installation cost. A number of innovative insurers are starting to launch solutions based on smart phones too, also incorporating satellite navigation, which records mileage, and an accelerometer that measures acceleration, braking and cornering. 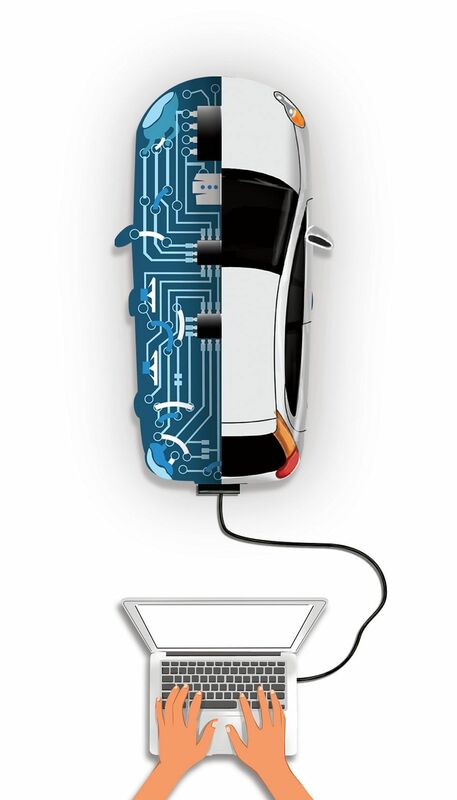 According to Mckinsey nearly 90 per cent of innovation in the automotive industry is driven by electronics. Initially onboard computers began telling mechanics exactly where to look when a car arrived for maintenance. “Today, wireless technology is changing how we view the car – and may soon change everything about the way we drive,” says Gulati.